We would like to draw your attention to a fabulous donation that has recently been bestowed upon us. 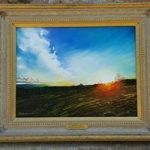 The donation is an oil painting by ‘The Modern Master’ Fine Art Artist, Philip Witcomb. The value of the Painting is worth approx £7K. Currently at the office if you are interested in a viewing) the colours are so vivid in real life. There is a very real reason why Phillip would like us to have this donation. Phillip is passionate about our charity and wishes when he had had a need for our services that he had been offered it. He understands what a massive difference we can make to a families in need. If you, your company or anyone you know is interested in purchasing the Oil painting Please get in touch with the office 01432 371212 or Myself Alison Jones 01432 371264 ali.homestart@gmail.com. Thank you.